The Benediction Sign is the result of a peripheral neuropathy affecting musculature in the hand. It is seen when the patient is asked to make a fist and the ring and little finger flex but the index and middle finger can't flex at the metacarpal-phalangeal joint or interphalangeal joint. There is some controversy as to the source of the Benediction Sign for many years, specifically if the median nerve or the ulnar nerve is involved. According to Futterman,  the desired position of the hand during a blessing or benediction would typically have been an open position with the fingers extended. In fact, he notes that the 4th and 5th digits would have been abducted from the second and third digits (similar to the hand sign used by Vulcans in the Star Trek TV and movie series). 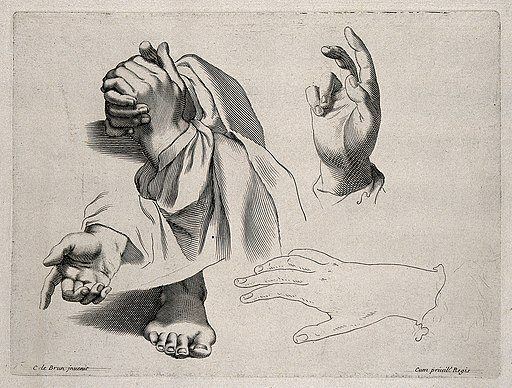 Based on this author's research of cultural artwork, he asserts that Peter, the first Pope, had an ulnar neuropathy which limited Peter's ability to perform the then-traditional open hand blessing and has led to the hand position that has since become the norm for giving blessings. In the presence of an ulnar neuropathy, function of the interossei and lumbrical muscles to the 4th and 5th digits would be compromised, thus the 4th and 5th digits could not abduct from the midline of the hand (interossei function) nor could those fingers flex at the MCP joints or extend at the IP joints (lumbrical function). Extensor digitorum (innervated by the radial nerve) acts primarily on the MCP joint, not the IP joints, therefore it could not extend the IP joints to compensate for loss of lumbrical function. As a result, during an attempt to extend the 4th and 5th digits (as in the open hand blessing described above) the MCP joints be extended but the IP joints would stay flexed. Futterman  notes that Benediction Sign is often described as a median nerve injury because this would result in an inability to perform flexion at the MCP and IP joints of the 2nd and 3rd digits. However, he notes that this would only make sense if the injured person was trying to make a fist and since a fist is not a historically-known sign of blessing or greeting, Benediction Sign must stem from an ulnar neuropathy and the subsequent inability to fully open the hand. ↑ 1.0 1.1 1.2 1.3 1.4 Futterman B. Analysis of the Papal Benediction Sign: The ulnar neuropathy of St. Peter. Clin Anat. 2015 Sep;28(6):696-701. ↑ https://en.wikipedia.org/wiki/Extensor_digitorum_muscle. Last accessed 13 02 2016.